The Stud of the Sea shared his thoughts on the last episode Below Deck. Captain Lee Rosbach did not hold anything back. In his personal blog, Captain Lee exclaimed, “Let’s get Chandler [Brooks] out of the way.” Yes, Captain lets, because enough cannot be said about the former My Seanna Bosun at this point. Do we want to bother anymore? This seems like a fair assessment. Chandler rotated around his own orbit with little interaction between other crew members. His schedule would vary between eating, napping, and scolding his deck team. Captain Lee wished Chandler the best for his future, but made sure to add “just not on my boat.” And not on any future episodes of Below Deck! The other minnow that departed during the last episode was Caroline Bedol. She abandoned ship after succumbing to her own paranoia about Kate Chastain and Josiah Carter. Before she left, Caroline misrepresented what was said when Josiah confronted her about getting up for work. Let’s talk about the “radio” incident, as Captain Lee called the blasting of “eviction music” from Kate’s mobile device. Captain Lee separated the crew involved into those on the right side, and those on the wrong side of that decision. Kate and Josiah were rightfully rebuked for terrorizing the already rattled Caroline. Ross received praise for shutting it down, and Caroline got the only bit of sympathy she deserved. I feel like this could apply to Rhylee too. Captain Lee called out Rhylee on her hostility toward her crewmates. He remarked, “Is there anyone that you are not going to be aggressive with on this boat?” Well, after seeing a preview for next week’s episode, it looks like she might get a little aggressive Ross after a few drinks. Then, Captain Lee advised her to “Dial back your aggressiveness.” He added, “Learn to use it as a tool when it’s called for.” Captain Lee said, “I do think the firm hand with her may pay dividends because you have tried the honey approach and that obviously didn’t work.” Ah yes, the firm hand. Let’s see how that works out. After, Captain Lee praised Adrian for staying focused on his craft throughout the drama like a true artist. Later, Captain Lee acknowledged Josiah and Kate for juggling the work of three people without complaint. 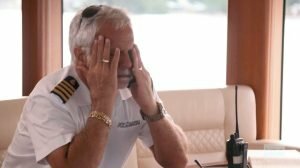 Though Captain Lee questioned Kate’s behavior towards Caroline during last week’s episode, he made it clear where he stands today. Captain Lee explained the difference between Kate and Caroline. He said Kate is “someone that I have worked with and had great results for over four years.” In contrast, Captain Lee worked with Caroline for a mere three weeks. Captain Lee concluded, “I will come down on Kate’s side every time.” As he should. TELL US- WHAT IS YOUR OPINION OF CAPTAIN LEE ROSBACH’S COMMENTS? IS RHYLEE GERBER AGGRESSIVE?